Fasting has been a part of the human tradition for many, many centuries - most religions periodically fast as an act of faith or penance - often as a means of purification. Way back in the 5th century Hippocrates the Greek "Father of Medicine", recommended abstinence from food to reduce symptoms of illness and boost immunity. In today’s increasingly materialistic and overindulgent society, regardless of our individual faith or non-faith traditions, we can all benefit from fasting from time to time. Wild View Retreat was lovingly restored from the ruins of an abandoned mountain village house, in the foothills of the Algarve, Portugal. The venue is completely isolated and submerged in nature, accommodating up to 22 guests in twin, double, or triple en-suite rooms, with a first class infinity pool and yoga studio facilities that will simply take your breath away. Fasting has many health benefits. It provides our overworked digestive system a well-earned rest from near 24/7 breaking down of food all day and night. Cellular energy is diverted to maintenance and repair of other bodily systems. Ultimately caloric restriction, within the limit, detoxifies the body, slows the aging process and gives a significant boost to the immune system and energy levels. At Wild View Retreat, guests are provided three delicious juices everyday alongside a warming soup or nutritious drink in the evening. 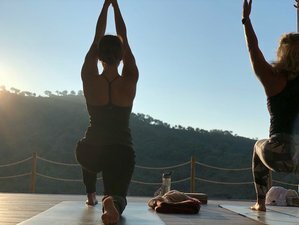 The juices have been carefully designed by Wild View Retreat's nutritional therapist to support the detox process yet keep nutrient levels sustained to enable daily participation of the fitness and yoga classes. The busy program of activity is deliberate to keep you distracted while you go through the fast. A daily program of workshops and talks are provided to support improving dietary and lifestyle habits. When guests finish the week, they feel renewed and reenergized armed with the tools and techniques to make positive improvements to their lifestyle. Note on the last day of the fast, guests have the option to break the fast with food samples made during cooking demos under the guidance of the nutritional therapist. Massages available at 50 EUR for one hour. Set amidst a spacious wilderness, Wild View Retreat is a tranquil space where you can slow down, switch off, and enjoy being led on a journey of well-being.